Nothing makes us happier than hearing from satisfied customers. If you'd like to submit a testimonial please email us at [email protected]. Or simply write a review of the product you purchased on the product page for that item. Here are some testimonials from recent shoppers. I ordered 4 blueberry bushes from another nursery last year and when I received them, they were scrawny and sad looking. I was so disappointed. So when I saw your Blueberry Glaze bushes, I thought I'd give it one more try before resorting to going to the local nursery and buying one that I could see and touch. I am so glad I ordered them. They just arrived and are absolutely gorgeous! They were packaged perfect, so no soil was spilt through the box and they have beautiful buds on already. I will be telling everyone I know about the quality of your plants. Thank you so much for a wonderful job. I am now a loyal customer! "We ordered quite a few boxes last year (between 50 and 100) of the Persimmons for holiday gifts. Our business friends LOVED them!" Two years ago I ordered, amongst other things, one of your Hydrangea Paniculata 'Great Stars.' The next year it bloomed poorly and I sent you an email asking if it was possible you shipped the wrong plant? You were kind enough to send me a replacement free of charge. I was elated as I really wanted that plant. Well, it is now 2014 and I have discovered that I have the plant in duplicate. Thank you very much. In April I ordered 6 lavender plants. I wanted to tell you that the packaging was beautiful and very careful. The plants were healthy and I was very slow in planting them. They are thriving lovely and I was extremely impressed by your product. Thank you very much. I will definitely order more from you. This year, with a new garden (we cleared and old large growth of bamboo) space, I've ordered from about 5 different nurseries, and just wanted to let you know I'm most impressed with WFF. The plants have all been vigorious and healthy, and arriving in good condition, which I know is not easy to accomplish. I'm specially delighted with the nicotiana I ordered, these are not easy to find; a long time ago I'd ordered nicotiana from Burpees, but when I looked this year, they were no longer available as plants, seed only, and that took me an internet hunt which led me to WFF. I admire these every day. Thank you. Next spring or this fall I'd like to order by phone, calling to ask for advice, tell you what I'm trying to achieve and get your recommendations on plants to order, if that is something you do. My father got this yellow tree peony for my mother for their 60th Wedding Anniversary. He planted it per your directions- but didn'n know if they would ever see it bloom. The description in the catalog says it would bloom in 2-3 years. Well it bloomed the first spring, it was in the soil. Not only was there 1 bloom, there were 4 beautiful yellow blooms. It is beautiful, everything they thought it would be! They are so pleased it is part of their beautiful garden! Thanks so much for the beautiful, healthy stock you send! Just received my replacement order - I thought it would be a bareroot bull rosa and was unbelievably surprised to find a blooming rose with many blooms on the plant (your photos does absolutely no justice to this beauty.) This rose is right up there with the most beautiful - thank you again. The flowers I sent my mother-in-law got the best results of anything I ever sent her - they just blew her away! It really gave her a "Burst of Happiness." Under Contact Us, you should add another category, this one labeled heartfelt thanks! I know: You are not only the topflight purveyor of plants, but modest as well. I have been one of your customers since the early 1980s when I began making a garden at my new homeplace. Obviously I am a very contented customer, or I would not have stuck around so long. 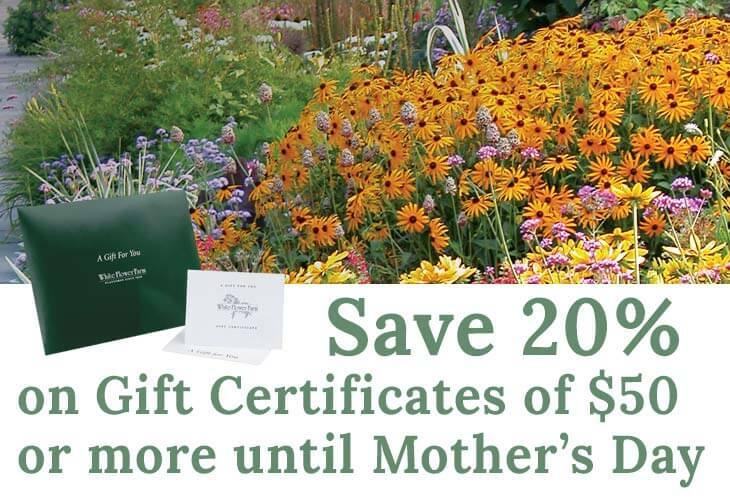 For the times I have praised WFF to the skies, and introduced other customers to you -- even sent your plants to them as gifts -- I still fell short. No longer. Before each Christmas, I looked at the lily-of-the-valley kit longingly, but had never ordered it until I received your last Christmas catalog. This time I surrendered, and ordered the lily-of-the-valley pips and soil for myself. When they arrived, I ignored all other tasks to pot them, and placed them in my little conservatory where they began sprouting within two days. They have been blooming like mad for nearly two weeks, and wafting that beautiful fresh fragrance that speaks so softly of Spring. I can promise you that hereafter, that gift to myself will be at the top of my order. What a joy they are! I love going into the conservatory with a cup of coffee in the pre-dawn hours. It is so peaceful among beautiful, blooming plants. But ever since the lilies-of-the-valley began blooming, that pleasure has been magnified many times over. That I bask in their beauty and fragrance is not a hyped statement. Having grown Convallaria outside for most of my gardening life, I know they are beautiful, no garden is complete without them. But yours have outbloomed all I have ever grown. Yours are more than holding their own with their companions in the conservatory, orchids, ferns, and a few subtropicals/tropicals such as Neomarica. The lilies-of-the-valley hold center stage just now, and are the first to attract the attention and admiration of visitors. Thank you for offering such a treasure! You have outdone yourselves. It will not surprise you that this curious gardener has ordered plants from many other sources. 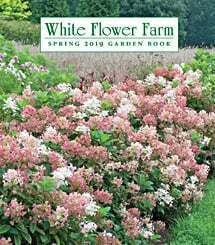 That said, I also tell new and long-time gardeners that for consistency, reliability, value, and plants that live up to the descriptions in your catalogs, White Flower Farm is my number one go to. I cannot remember ever being disappointed with your plants or your service. HEARTFELT thanks to each and all of you! And a Happy New Year! I can't thank you enough for my two recent hydrangea orders, plants in excellent condition and health and they still look great as the day I received them. I appreciate the effort and time it took to pick out my plants and get them ready to be shipped. I am so grateful for the outstanding customer service that I This validates why I will only order plants from your company and no one else. I love my Limoncello bush roses! They started blooming shortly after planting last spring and have been full of blooms ever since. I regularly receive compliments on them. They have tripled in size in one growing season. Thank you for such an outstanding product. Thank you for the beautiful Amaryllis (Royal Velvet) plants I sent to my family and friends for Christmas of 2012. They were all estatic about them, and excited to watch them bloom. What a joy! Keep up the great work! I have been ordering from White flower farm for business clients for almost 10 years now. I am in the financial advisory business and appreciate a solid customer service model. kudos to you! Thanks again for all that you do to keep MY clients happy each year. I LOVE getting pictures from clients throughout January, February and even March showing me the progress of their Amaryllis'. A little sunshine in the dark of winter. We have almost 100 people on our 'corporate holiday gift list.' We've sent 'grow-your-own' amaryllis plants from White Flower Farm for the past two years, and the responses have been positively enthusiastic – even enthusiastically positive, on the order of "Thanks for the beautiful plant." The holidays can be stressfull. That's why, for the last 10 years, I've purchased holiday wreaths from White Flower Farms for clients, family and friends. The quality of their wreaths is absolutely the best and never fails to illicit praise for freshness and fragrance. In addition, the WFF's staff is very professional. It's easy to place orders and you can have confidence they'll be shipped in a timely manner. I highly recommend the WFF products and organization for truly memorable holiday gifts! My order arrived yesterday & was packaged beautifully. I can tell a lot of attention goes into each order. When I called to place my order I spoke to a lovely woman who was very knowledgable and seemed interested in helping me select the proper plants for my area. Top notch service with superior quality. I would like to state how absolutely thrilled I am by the quality of the plants I received from White Flower Farm. Thank you so much. I will certainly do business with your company again! I will recommend my friends to order from White Flower Farm also! I would like to take this time to include a commendation for CS Representative Rena who listened explained sought out the right thing to do and handled all with an interested helpful professional manner. She kept a smile to her tone. I wanted to let you know that I received your 2012 Holiday Catalog on Friday and I have to say that of all the years I've been in the Nursery Field/Business it was by far the most Impressive in the overall layout and presentation of the Holiday Gifts you are offering this year. You guys & gals do a "PHENOMENAL JOB" at your presentation, and the uniqueness of your product. Keep up the wonderful work. Have a "GREAT" weekend.